If you’ve been thinking about installing new blinds, shades, draperies, or plantation shutters, you may want to consider a modern, technological solution: motorized window treatments. With the advent of the “smart home” and all that entails, it is becoming more and more common for people to automate certain functions of their home. Whether it’s preset mood lighting, revolving ambient music, or – in the case of Flair Interiors – automated window treatments. Motorized window treatments are a great way to set the stage in your home. Able to be controlled via the flick of a switch, the press of a button on a remote, or even with your cell phone or tablet, these treatments allow you to precisely control your home’s mood, ambiance, and schedule. Expecting guests at dusk? Program your blinds to open just as the sun sets to create a warm, inviting, and stunning view. Have trouble waking up in the morning? Set your drapes to whisk open at 7:00 a.m. and open your eyes to warm rays of sunlight. As part of any smart home, motorized window treatments are a great addition. They can draw themselves closed when you start a movie, creating a theatrical environment. They can be programmed to open slightly when the lights are dimmed, bathing your home in warm, dusky tones. They can be made to work with your preferences and, most importantly, they can work with – and amplify – the interior design choices that you’ve made in your home. At Flair Interiors, we strive to provide our customers with a multitude of options when it comes to their home’s interior design. 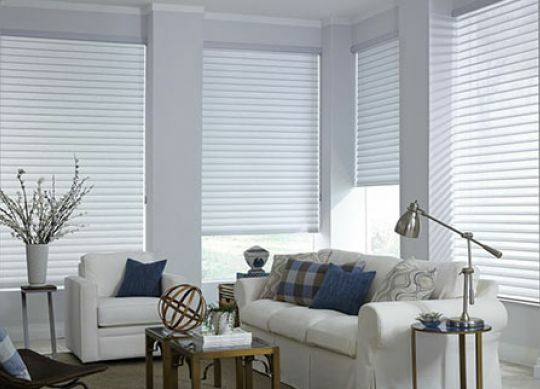 Motorized window treatments are a great way to accentuate the decisions that you’ve made. Whether you’re looking to fully automate your treatments, allowing you to create ambiance while keeping your “hands off,” or you want to directly control your blinds via a remote, the team at Flair Interiors can help!